Earlier this week, we saw Republican Candidate for Treasurer Bob Grogan post on his Facebook Wall a link to an "online poll" that focuses on the race for Illinois Treasurer. You can see the post embedded below. In it, Bob Grogan issues a plea to his "followers" to vote on the poll. Post by Bob Grogan, CPA. That link posted takes you to a poll hosted by "Polling for Illinois". We took a peek at the results, and (at least for Bob Grogan and his campaign), they're not pretty. You can see the 'live' results here. 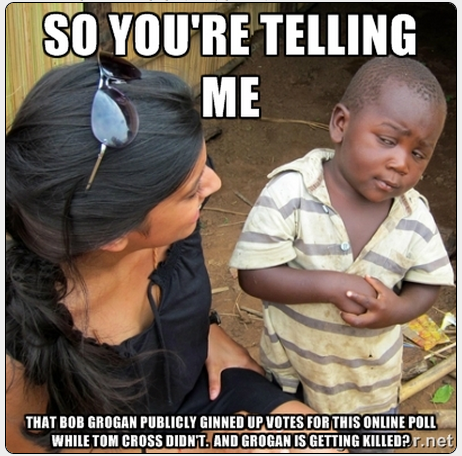 With close to 1000 votes cast, Bob Grogan has secured 20% of the vote to Tom Cross' 80%. Made us wonder if the Tom Cross for Treasurer campaign was promoting it, too. A quick look at the Tom Cross for Treasurer Facebook page, the Tom Cross for Treasurer Twitter handle, and the Tom Cross for Treasurer website, we couldn't find nary a mention. So...you're telling us (hint! Check out who plays the post off at the end to see how this all ties together!) that just one candidate (Bob Grogan) promoted a poll to their audience and yet he still is getting buried in the votes? If we're totally honest with ourselves, we here at the Truth team, aren't surprised. From our read of the race, Tom Cross has put in the time, built the track record, traveled around Illinois supporting candidates up and down the ballot and has a broad base of support. But...back to the actual poll. Some of the comments/rebuttals are priceless. We're thinking that some plants from each of the campaigns are involved here, but we can't verify that thought. What is clear, however, is the frustration level demonstrated by the supporters of Bob Grogan, and the calm, clear and direct response by supporters of Tom Cross for Treasurer. Prime Example: Grogan supporter must be troubled by the huge vote lead that Tom Cross has over Bob Grogan. So, he/she makes a statement about how the votes must be due to "government" workers casting their votes. And the response from a Tom Cross supporter? Direct and effective.